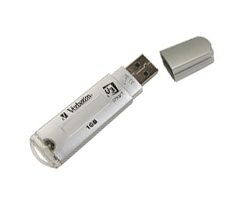 Verbatim Store’n’Go U3 Smart Drive is a flash / thumb drive that is based on new mobile computing platform – U3. U3 brings the power of portable software to a USB device, turning it into a revolutionary U3 Smart Drive that enables you to carry smart software applications, PC settings, files and personal preferences wherever you go. Blue LED can become annoying in low light situations.